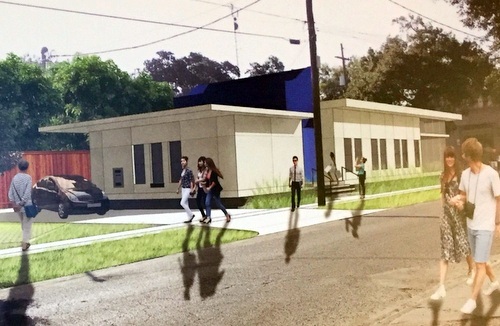 A small Baton Rouge bank intends to enter the New Orleans market with a new location on Magazine Street, and neighbors hope that the building design and drive-through they plan will fit in well with the neighborhood. 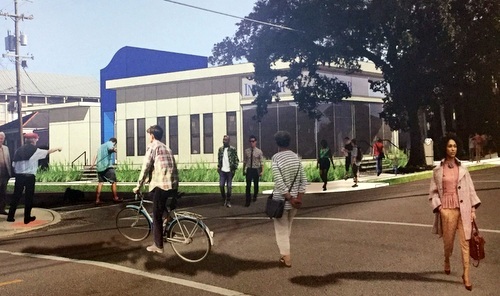 Investar Bank — which lists 10 branches mostly around Baton Rouge but also in Metairie and Mandeville — held a meeting with residents in November to discuss its plans to build a new location at 3627 Magazine Street. The site already has a parking lot, and Investar officials hope to convert part of it into a drive-through area, which will require City Council approval, according to plans shared at the meeting. Robert Kocher attended the meeting with some concerns about the request for the drive-through, but found the Investar representatives open to discussing them, he told the Faubourg Delachaise Neighborhood Association at their quarterly meeting Tuesday. Specifically, the design presented for the drive-through brought cars in off of Magazine Street, and let them exit onto Antonine, Kocher said. That plan seemed sound, Kocher told the association, but he worried that the organization of the parking lot left only four actual spaces, which themselves could all be taken up by bank employees. The bank’s architects, however, were willing to discuss rearranging the plan to fit a total of eight spaces, Kocher said, which would likely handle most of the bank’s customers and have some room for Lilette’s use at night. Some Faubourg Delachaise members were nonplussed by the idea of a drive-through on that section of Magazine at all. “There are drive-through banks on Tchoupitoulas, and that’s where they belong,” said Brittany Greiffenstein. Kocher, however, said that since Investar is still a small bank, he didn’t anticipate a heavy impact on the neighborhood. He said a reasonable compromise would be an increase in the parking, a zoning change for that property alone (not all of Magazine Street), and a design aesthetic that matches the surrounding properties. The building is about the size of a double shotgun, he said, and that model might make a better design than the more modern building proposed by the bank. Kocher said he has been in contact with City Councilwoman LaToya Cantrell’s office about the bank. The association did not take a formal position on the bank, and the Neighborhood Participation Plan meeting report is not yet available on the city website. The property is currently home to the Lambert’s Orthotics and Prosthetics building, but a representative of that business referred questions Thursday morning to the bank. Lisa O’Deay, a spokeswoman for Investar Bank, said she was unaware of any changes to the bank’s plans since the November meeting with residents. The association also heard reports about the Lyons-Burke Booster Club, on the discussion of a new dog park near the neighborhood, and on the new Uptown historic district and on short-term rentals from the Preservation Resource Center. Faubourg Delachaise Neighborhood Association represents the area from Peniston to Louisiana Avenue, between Magazine and Tchoupitoulas, and more information can be found at their website. No more big box stores or chains on Magazine! We don’t need anymore Mexican or Asian places either on that street. We could use more bars and local restaurants with local cuisine and no hipster influence. We are also severely lacking in firearms stores in Orleans Parish.